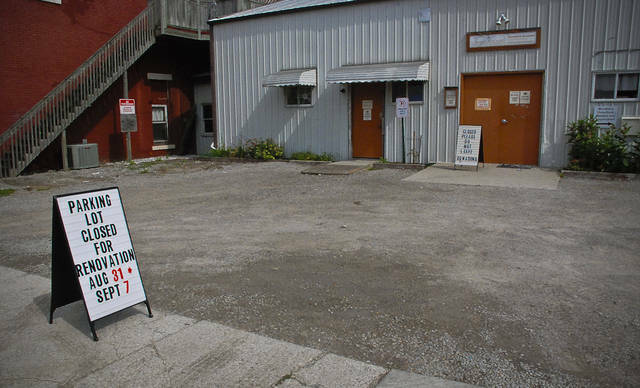 The old gravel parking lot of the Common Ground Free Store Ministry will soon be paved for the first time in its history. Griner said Common Ground Free Store, located at 193 E. Central Ave, Delaware, has established partnerships with area businesses, civic organizations, churches, and citizens who all donate to the store. She said the store has been in operation for 11 years serving the local community. It’s really difficult for patrons of the store who are in wheelchairs to navigate a gravel parking lot, Griner said. It becomes even harder for them in the pouring rain when the potholes become mud puddles. She said the parking lot has been deteriorating for quite sometime, but the funds to have it paved weren’t available to fix the cascading problem. According to Griner, a couple of community members, who asked to remain anonymous, and the landlord of the building donated the funds to have the paving done. “The donors saw a need here to take care of it for us,” she said. But Griner said she was really surprised by the generosity of Neff Paving, the company that will do the paving, which also contributed to the project. Griner said Neff was doing another job elsewhere before coming to do the store’s parking lot. The company will use the leftover materials from the first job to pave the store’s parking lot. According to Griner, the store was started by the William Street United Methodist Church. She said the group was going to Athens, Ohio to help the people there when they realized there were people in need in Delaware as well. Griner said the store has no affiliation with any of the local churches other than that the store receives donations from them. The Common Ground Free Store is receiving a much needed gift from members of the Delaware area community. The old gravel parking lot in front of the store will be paved for the first time in its history. Executive Director Sharon Griner said patrons in wheelchairs have a tough time navigating the parking lot in dry weather, but when the potholes fill with water from a downpour, the mud puddles make it worse. This entry was tagged Common Ground Store, delaware, Neff Paving. Bookmark the permalink.